Are you looking to get into kiteboarding or windsurfing but the high price of new gear is beating your dream down? Now is your chance, every year we take in consignment kiteboard & windsurf gear from our local riders, most of the gear is in fantastic shape with a lot of life left, some of it, well, is not , but the price reflects it! The list will change often so keep checking back for “new” arrivals! Too lazy to stop in, we’ll ship it out to you! Booms, universals, mast ext. & other items also on sale. You better not wait, the wind gear is going away very soon……..like Monday 10/13!!!! The Fanatic Bat has sold……..yes, she has finally found a good home! Hurry on in & grab some consignment gear before it goes away. It’s outta here in October!!!! Package special! Buy the RPM 6 & RPM 8 (both come complete with bars & line) for $1088!!!!!!! Both!! Thats a $100 savings! Don’t hesitate on buying any of the consignment gear, it will not be here forever, usually mid September is as long as we have it. 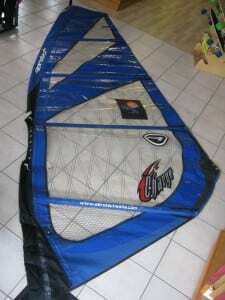 2012 Slingshot RPM 8 complete kite just has been massively reduced to $739.95!!!!!! Kite, bar, lines. pump & bag!!!!! $739.95!!!!!! Its only been used twice, TWICE!!! 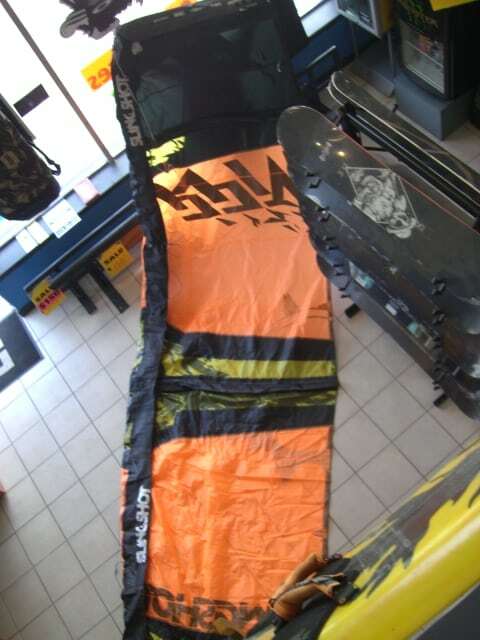 Price reduced on the 2009 Ezzy 6.5m Freeride sail!!!! Now on sale for $289!!!!! SOLD!!!!! 6.5 Aerotech, boom, 430 mast & ext. All heading up to Rondeau Bay Canada! SOLD!!!! 5.7 Aerotech sail, 430 Powerex mast & long ext/uni combo! New arrivals!!!!!! We just got some new (lightly used) gear in! Aerotech 6.5 sail $95, Simmer 5.0 $125, Powerex 430 mast $135 & Chinook uni & extension $50. RRD FSW 95 liter windsurf board—SOLD!!!!!!!!!!!!!!! That one was quite the deal! Aerotech 4.5 charge may, MAY be sold……we’ll know soon. New Arrival!!!! Slingshot Diesel 11m kite, bar, lines & pump…….LIKE NEW!!!!!!! $350.00!!!!!! !—————— $350.00 yo!!!!!!!!!!!! Price reduction!!!!!!!!!!! Fanatic Bat 160ltr windsurf board now $99.00!!!!!!!!!!!!! Love those old bats. Does yours have any texture left and does it come with the mast base? I “sugar decked” it with resin a few years back, so yes it does have texture & it comes with the fanatic mast base. The centerboard gasket is also still flexible. $99 bucks with the uni~ how can you beat it?!?!?! New Arrivals!!!! Cabrinha Revolver 7m kite complete & 2.2m trainer kite. Both in near new shape & priced to sell!!!!!! By any chance do you have an old O’brien mast base? no sorry, we have new screw on mast bases but not old obrien bases. New arrival~ Naish Evolution windsurf sail 6.0m. A few patches but the price is right! SOLD!!!! 460 mast sold, Chinook slalom boom & Mistral 5.7 sail…….found a good home up in Michigan. I believe we have a 2008/09? RRD FSW 95 windsurf board coming in, IF it arrives its in great shape! I’ll confirm & give $ ASAP…..
2009 RRD freestyle/wave 95 glass/wood construction just arrived! It is in mint shape, super light weight & low mileage! Complete with foot straps & fin. Take this beauty home for only $660.00! Stop on in & check it out! We just got a lot of nice windsurf gear in……..4 sails(10.2, 8.5, 5.7, 4.5), 2 Chinook booms, 1 mast (490 90%ca)& 3 mast extensions-priced to move, I’ll have it up by Monday! Do you still have this 490 mast? I know it is a long shot, but I need one. JP 129 board, 7.5 sail, 520 mast, chinook boom, ext & base….SOLD!!!!!!!!!!!!!!!!!!!!!!!!!! picked up!!!!! So now it has officially SOLD!!!!!!!!!!!!!!!!!!!!!!!!! We just received some super fantastic, mint condition windsurf/SUP gear in!!!!! New consignment arrival- 2008 Ezzy Freeride 6.5 sail, $349 OBO……..
2 new windsurf boom arrivals. Chinook comp boom for $50 & Naish boom for $25. What a deal, what a steal! Looks like I’m headed to Maumee Bay SP for a feeler. Windy in the point, not on sensors.